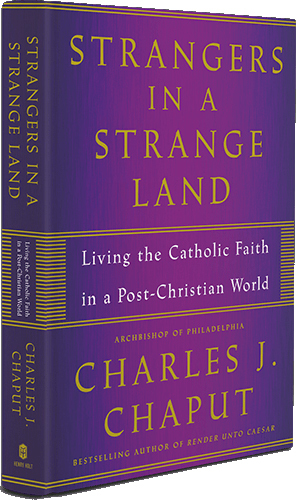 A new study guide to accompany Archbishop Charles Chaput’s book, “Strangers in a Strange Land,” has been developed to deepen one’s reflection of themes in the book published last February by Henry Holt & Co. The study guide is available here as a pdf document and includes five questions for discussion based on each of the book’s 12 chapters. The book explores themes of how Catholics can live their faith in today’s post-Christian world. Purchase a copy on Amazon.com or BarnesandNoble.com. CatholicPhilly.com offers an excerpt here, and a Q&A with the archbishop about the book here. Thank you for a study guide for your book:STRANGERS IN A STRANGE LAND. I am now reading your book a second time. I understand your book but a study guide will be most useful in directing me when discussing its contents with my friends and in occasional homilies. Thanks for your help I already have the book.